Dessert Designer: Creations You Can Make and Eat! by Dana Meachen Rau. Review: Colorful, cute, easy, and fun! The kid's cookbook by Dana Meachen Rau Dessert Designer is brilliant, and definitely original! The cupcakes, cookies, candies, and cakes are wonderful. I would have never thought that such splendid things could be madeÉ with frosting! Dessert Designer contains an organized template for creating desserts. It starts with descriptions of essential tools for these projects such as bags, rolling pins, a hammer (to crush candy), parchment paper, kitchen shears (scissors for food), and lollipop sticks. Recipes are categorized by the type of dessert. The desserts range from quick and easy gumdrop monsters, to elaborately detailed pool party cakes. The vibrant colors and imagination in the treats are inspiring. Every treat looks too beautiful to eat, and that is quite the compliment for a chef. Also, the step-by-step instructions are equally appealing. The instructions could, however, be more detailed. For people who have not done previous arts and crafts, like duct tape roses, the instructions might make some of the projects difficult to make. But, the book is still overall appealing. The food Dana shows is cute and great for kids, both girls and boys. That is because there are creations ranging from volcanoes and monsters to purses and flowers. Nonetheless, I feel like the target audience is younger girls, between eight and thirteen years old. However, there should be parent supervision for the occasional recipe that requires the use of the oven or a hammer, just for safety. Most of the creations don't need complicated tools, though. Dessert Designer has descriptive instructions with inspiring pictures worth a thousand words. Like Dana Meachen Rau says, "Bring your toy to the table and have some fun playing with your food." We would like to thank Media Masters Publicity for providing a copy of Dessert Designer: Creations You Can Make and Eat! for this review. 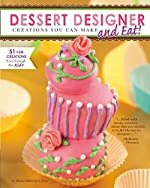 Have you read Dessert Designer: Creations You Can Make and Eat!? How would you rate it?